For beekeepers with a limited number of hives, the traditional methods for queen rearing are often impractical due to the large number of colonies needed. The Cloake board method lets you raise high-quality queens by using a single hive as your donor, cell starter and cell finisher. I used this method for the first time this year (2012) with excellent results. 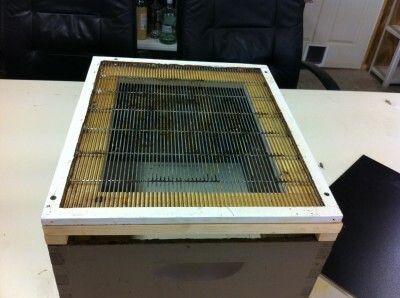 A Cloake board is a piece of beekeeping equipment that creates an upper entrance between the first and second hive bodies. It is fitted on top of a queen excluder, and has a removable “floor” that allows the beekeeper to completely separate the two hives. 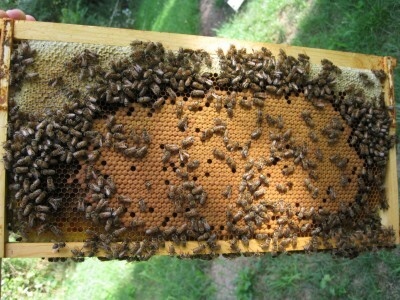 When the floor is removed, the workers are able to travel throughout the hive, while the queen remains trapped below the excluder. You can buy a Cloake board from any of the beekeeping supply companies, but where’s the fun in that? Avail yourself of every opportunity to use your table saw. Assembly is pretty easy. You’ll need some 3/4″ pine boards and a queen excluder. Assemble the parts as shown below. I used a high-quality wood glue and pneumatic staple gun. The hive body is shown as a reference. Flip the unit upside-down and attach a queen excluder using short drywall screws. Construct the floor. 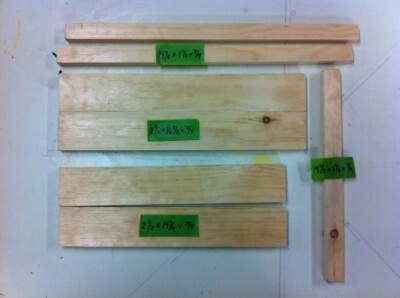 Cut a 19 3/8 x 14 piece of 1/8″ plywood. I used a piece of “wood” left over from a wobbly Ikea cabinet. 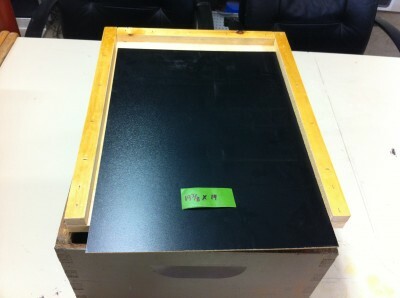 It should slide freely into the Cloake board and make a bee-tight seal. With your Cloake board in hand, select a strong colony from which you would like to make your queens. This colony must have at least two deep supers at the bottom (or mediums if you’re an all-mediums shop). Select a colony that has the traits that you’re looking to include in your new queens. I usually consider gentleness, laying pattern, pest tolerance, and honey collection over any particular race of bees. Now we’re ready to raise some queens. The procedure is not difficult, but careful timing of the steps is essential. There are many variants of this system; this is the no-graft method which I have been using with good results. 1) Disassemble the hive, separating the lower two supers. Leave the bottom super on the bottom board. 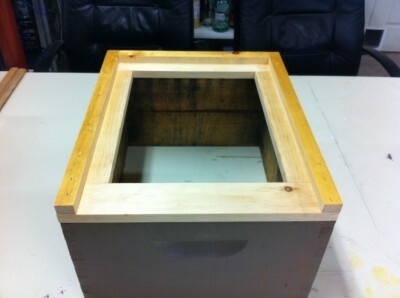 2) Spin the bottom board and bottom super around so that the entrance now faces the back of the hive. Close this entrance completely so that bees can not pass through it. #8 hardware cloth works well for this purpose. 3) Find the queen. If she isn’t in the lower box, move her into it. 4) Move two to four frames of uncapped brood into the second hive body. Be sure to mark these frames somehow (Sharpie marker or thumb tacks) as you’ll be removing them in two days. 5) Install your Cloake board with the entrance facing in the original forward direction on top of the bottom super. Do not install the floor board at this time. 7) Open a bottle of mead, pour, enjoy, and leave this colony alone for 24 hours. The field bees will now return to the hive, find their original entrance missing, and eventually discover the new upper entrance. The frames of uncapped brood that we moved to the upper super will cause some of the nurse bees to move up to tend to the young. This is very important, as we need lots of young bees with active hypopharyngeal glands to make the royal jelly essential for queen production. 1) Install the floor board into the Cloake board. This prevents bees from crossing back and forth, effectively creating two separate colonies. 2) Open the rear bottom board entrance. 3) Open a bottle of mead, pour, enjoy, and leave this colony alone for 24 hours. This step illustrates the genius of the Cloake board design. Bees in the bottom super can only exit the colony through the newly-opened rear entrance. The field bees, however, are oriented to return to the hive through the front Cloake board entrance. When the foragers return, they’ll enter through the front and be forced into the upper boxes by the floor board. This causes a large number of bees to build up in the upper supers. “Lots of bees” is key for raising excellent queens. 1) Remove the frames of uncapped brood that you installed on Day 1, shake the bees into the upper colony, and then place the frames back into the bottom colony. 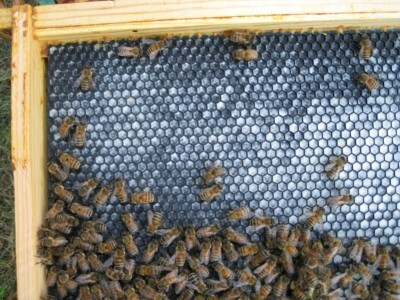 If there are any queen cells started on these frames, scrape them off. 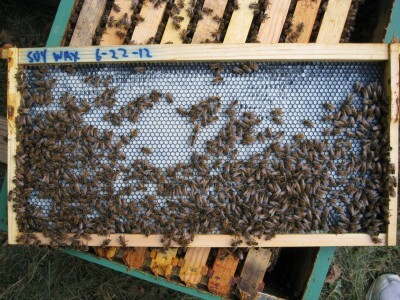 If there is no room for these frames in the bottom colony, simply add another hive body below the Cloake board. Be sure to fill any empty spaces in this new super with foundation, otherwise you’ll have a burr comb mess to clean up later. 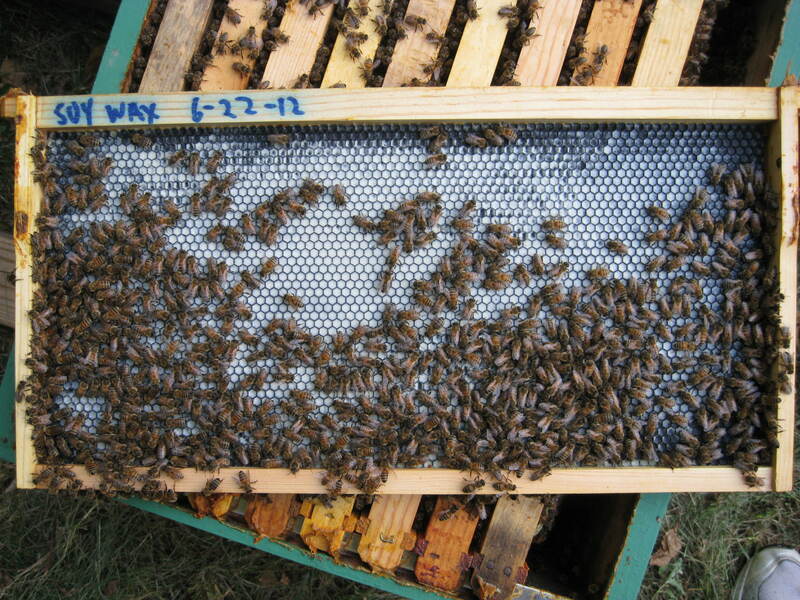 2) Move one frame of uncapped brood from the lower colony to the upper colony. Again: Do NOT choose a brood frame on plastic foundation for this step — you will be unable to cut out any queen cells if you do. 3) This step is optional, but it is worth the trouble: Add a division board feeder to the upper colony and fill it with 1:1 sugar syrup. Add a pollen substitute patty (I like MegaBee) to the colony near the frames of uncapped brood. 4) Open a bottle of mead, pour, enjoy, and leave this colony alone for 24 hours. By this time, the bees in the upper box realize that they are queenless and will begin creating emergency queen cells from one-day-old larvae in the brood frame you just moved to the upper colony. We removed the original brood frames from the upper colony so that the ample supply of nurse bees will focus their queen-rearing attention to the one frame of brood present. 1) Check the upper colony. 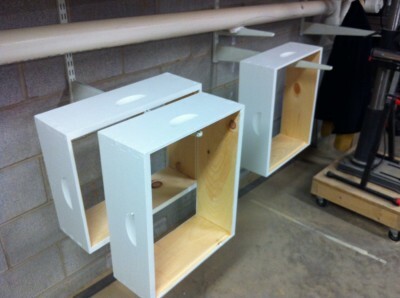 The frame of brood we installed on Day 3 should have a number of emergency cells started. If not, wait one more day before continuing the process. 2) If ample queen cells have been started, remove the floor from the Cloake board. Make a note of how many cells have been started. Once queen cells are started, the bees will finish them, even if a queen is present. By removing the floor board, we are putting the colony back in its original configuration. 1) Do not open or otherwise disturb the colony. The bees will finish capping the queen cells, and the queen pupation stage will begin. If you handle queen cells during this time, the young queens may be damaged. 1) Prepare your mating nucs. Transfer 2-3 frames of capped brood, bees, honey, and pollen into a 5-frame nuc box. If they do not have ample food, be sure to feed them with a division board feeder and 1:1 sugar syrup and a pollen substitute patty. 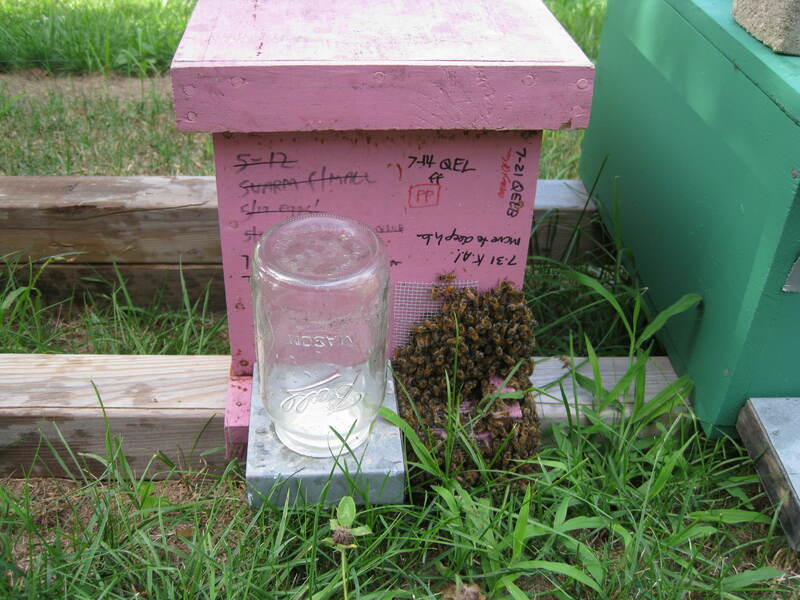 Reduce the entrance to this nuc, as it will have insufficient bees to prevent the robbing of the syrup, especially if there is no nectar flow in your area at the time. On Day 4, we made a note of how many cells had been started. Prepare as many mating nucs as your beeyard can supply. For a small operation, one mating nuc for every two queen cells works well. 1) Open the breeder colony. 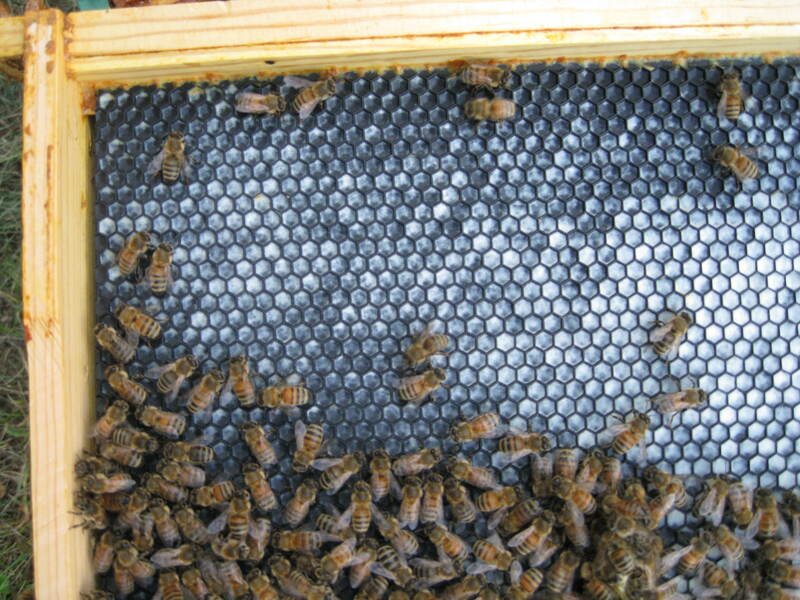 Use a sharp knife to carefully cut the queen cells out of the brood frame. Gently transfer at least one queen cell into each mating nuc. Use your thumb to create an indentation near the top of one of the frames in the mating nuc, and then gently nestle the cell into the comb. Be sure the bottom of the cell is facing down and that the point of the queen cell is not obstructed by comb. You will likely have more queen cells than you have mating nucs. In that case, add additional queen cells to your mating nucs until they are all used up. 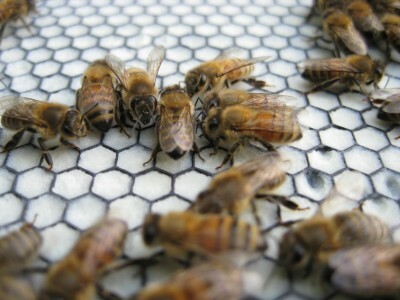 If you have extra cells, contact the folks in your beekeeping club and see if anyone else needs any queen cells. They’re not like kittens — you’ll have no problem finding them good homes. 2) Remove the Cloake board and return the entrance to the original direction, if desired. The queens will hatch on or about Day 15. The queen will leave for her mating flights around Day 20. Inspect the nucs. If the queen hatched and mated successfully, you will see eggs in your mating nucs. Keep an eye on your new nucs. Once you start to see brood patterns as in the photo above, it’s time to transfer the colony into a full-size hive body or harvest your queen for use in another hive. If you have any questions, please leave them in the comments fields below. 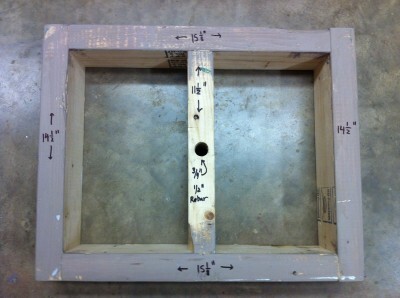 Assemble the pieces as shown, using 3″ drywall screws. 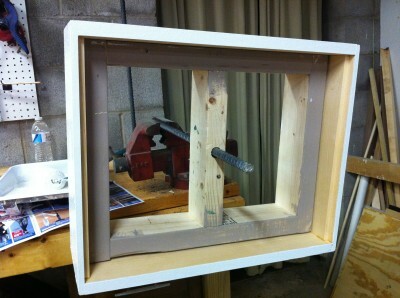 Drill a 3/4″ hole directly in the center of the middle board as shown. 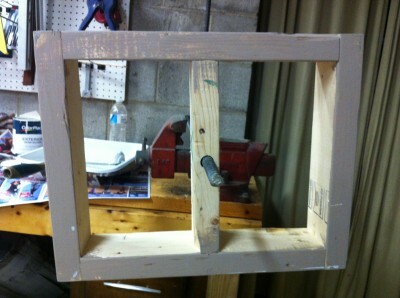 Next, rig up something to hold the piece of 1/2 rebar at a comfortable painting height, as shown. I use my workbench vice. Then slip the box over the rebar. Give it a spin to make sure it rotates smoothly. 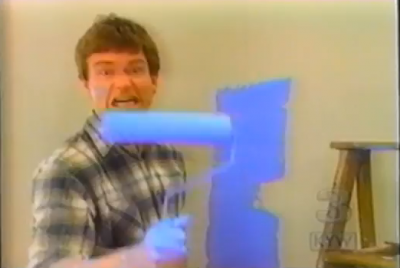 Now you’re ready to paint. Get your paint tray and roller queued up, and slip the super to be painted over the box. Be sure to center the super over the 2×4’s so that you can easily paint both the front and back edges. When you’re finished painting. remove the super by lifting on the unpainted inner surface, and then hang it up to dry. Shelf brackets work well for this purpose. I hope that this technique makes your painting tasks a little less awful.